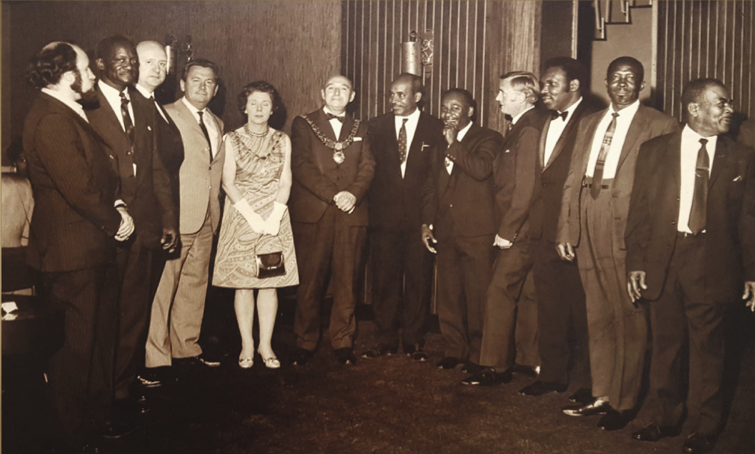 The first seed of the Derby West Indian Association was sown in 1955 when a group of West Indians in Derby met in a house of a friend to discuss unity and survival in a foreign land. However, the Association proper was formed in December 1961, and the following is a quotation from the minutes of that meeting. “A draft constitution was presented to the audience, which numbered well over 100 for their approval, and after the draft constitution be accepted, it was also agreed that the name of the organisation should be the “Derby West Indian Association”. The election of officers took place under the guidance of Mr. A. Bethume, Community Development Welfare Officer of the Migrant Services Department of the Jamaican High Commission”. (Mr. Bethume has now been dead for some years but his thoughts are with us). The following persons were elected as officer for the period of one year. Several attempts were made to establish a Centre for West Indians but without success and West Indians continued to have meetings in each others homes and using the local authority premises at Peartree House at times for larger meetings. In 1977 Mr. S.A. Walters became President and the search for some base for the West Indian Community again began in earnest. With the help and advice of the Derby Council for Voluntary Services, an application was made to the Department of the Environment for a grant towards what was called a “Day Centre”, with a hall to provide accommodation for 200 people, a nursery, a room for the elderly West Indians, a library, office, Committee Room, indoor games equipment and furnishings. The application however failed. An application in 1977/78 for £49,000 under the Government Urban Programme through Derbyshire County Council was successful, at which time most people now felt our problems were over but it was not until 1981 that we were able to move into the first phase of the building. A steering committee was quickly set up with representatives from the County Council, Derby CRE, members of our Committee and members of the community. A number of buildings were looked at including the Unity Hall, St. Augustine Church Hall and St. James’ Church Hall, but they all fell through. Help was sought from all quarters, including church bodies and M.P’s whilst the search for an appropriate building went on without much success and the threat of the grant being frozen and/or withdrawn. A reprieve of the grant with an extension of one year, to be taken up in 1980/81 delighted the Committee who had not weakened in their resolve, in spite of repeated failures. A final attempt was made to the City Council for help to find a site for the Centre. A meeting with Councillor Mick Walker and Mr. Cowlishaw, members of the steering committee and Mr. M. Crosdale – Community Relations Officer (CRE), proved to be successful in obtaining the plot of land on which the Centre now stands. This land was bought and paid for by Derby City Council at a cost of £9,000 and given to Derby West Indian Community Association as freehold premises. Mr. Charles White, Mr. Brian Ambrose, Mr. Scott, Mr. Humpston, Mr. Taylor, Mr. Calladine, Mr. Milton Crosdale and all the members of the Management Committee, without whose help we would never be able to establish the Derby West Indian Community Cultural Centre. The Centre was officially opened on 31st July 1982 at 2.00 pm, jointly by the Mayor of Derby, Councillor Norman Glen, and the Lord Lieutenant of Derbyshire, Sir Peter Hilton. The High Commissioner of Trinidad and Tobago, Eustace Seigaret was our Guest of Honour. We want again to thank our forebearers for their insight and foresight in forming this Association.